WE DEAL IN ORGANIZING ALL TYPES OF JALWA CEREMNY FUNCTIONS. 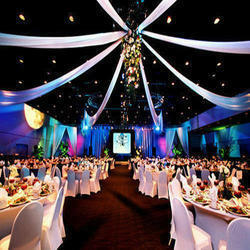 We are the foremost service provider of Awards Ceremony Management Services. The presented services are handled by our skillful professionals. Our experts are well-trained who conduct this service with meticulous execution and planning. Also, we provide this service to our client at most reasonable prices. Let us help to meet your ceremony successful. Having a ceremony and managing on ground could be a very difficult task and tiresome. So, count on us to make your event and get together a memorable one. Corporate Organizers Pvt. Ltd. specializes in making all types of ceremonies like Birthday, Wedding, Anniversary or a Corporate Party, etc. to be a Unique event suiting your demands and requirements.